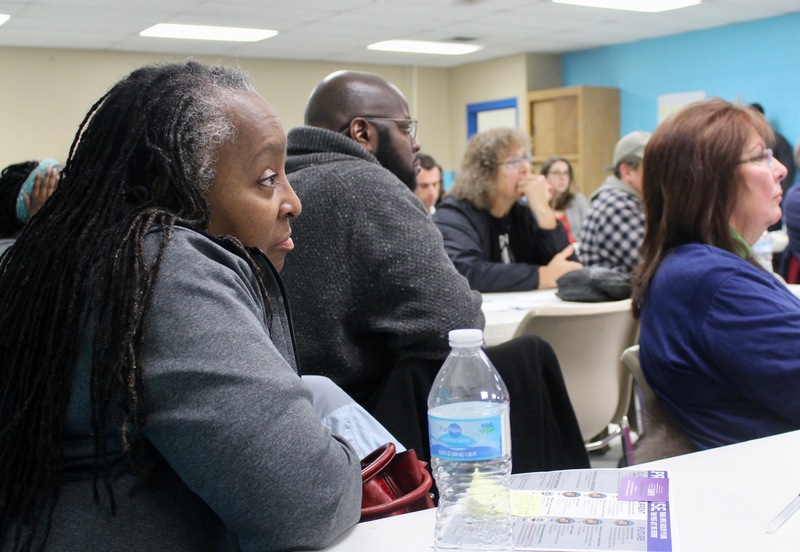 Gwendolyn Bivins, a middle school teacher and Milwaukee County resident, listens to the county’s presentation on its newly proposed youth secure residential facility. Milwaukee County will open a new secure residential facility for youth on the far northwest side of the city in the Havenwoods neighborhood after Lincoln Hills and Copper Lake close in 2021. Representatives from the Milwaukee County Department of Health and Human Services announced the potential sites for the new facility — 6101 W. Mill Road or 6600 N. Teutonia Ave. — at a community meeting Thursday at St. Peter-Immanuel Lutheran Church, 7801 W. Acacia St.
Act 185, the state bill that will close Wisconsin’s youth prisons by 2021, mandates that Lincoln Hills and Copper Lake be replaced with a smaller state-run facility for those in the Serious Juvenile Offender (SJO) program, as well as with smaller regional facilities throughout the state that will be run by counties for youth with less serious offenses. A regional facility run by Milwaukee County will be built and located at one of the two Havenwoods sites. The county considered renovating the existing Vel R. Phillips Youth Detention Center, but leaders concluded that it would be more expensive than building a new facility that better accommodates its needs. The two potential sites are now home to a parking lot and an open field. The state-run facility also may be located in Milwaukee, according to recommendations submitted to the state Department of Corrections by the Juvenile Corrections Study Committee, but state officials have not made a final decision. Milwaukee County officials said they are taking this opportunity to create a new model for youth justice in Milwaukee that is intended to reduce recidivism and promote positive outcomes for youth while maintaining neighborhood safety. The county-run facility will be for youth who have been convicted of lower classifications of felonies such as battery or theft, and youth who have been convicted of non-felony offenses, such as petty theft, disorderly conduct or drug possession, but are still deemed to require secure placement. If the facility were to open tomorrow under these criteria, 56 Milwaukee youth who are at Lincoln Hills would be placed there. According to Mark Mertens, administrator of the Milwaukee County Division of Youth and Family Services, the facility will emphasize youths’ reintegration into the community. One of the most obvious differences is the location of the facility. Lincoln Hills and Copper Lake are more than three hours away from Milwaukee. Proximity to youths’ families and existing support systems were important considerations when identifying potential locations, according to Mary Jo Meyers, director of the Department of Health and Human Services for Milwaukee County. In addition to looking for a site within the City of Milwaukee, where most adjudicated youth come from, Mertens said the county sought a site on surplus county-owned land that was least five acres, easily accessible to public transportation and close to other community resources for youth. David Muhammad, deputy director of the Milwaukee County Department of Health and Human Services (HHS), shows that the majority of youth from Milwaukee who are at Lincoln Hills and Copper Lake live near the newly proposed facility locations. David Muhammad, deputy director of the Milwaukee County Department of Health and Human Services (HHS), said the new facility will not look a prison and will be “homelike.” He said that county officials are considering models from places such as New York and Washington, D.C., where recidivism rates dropped dramatically in recent years. Mertens said that there will be no use of pepper spray or solitary confinement in the county-run facility, referencing a recent report that showed the continued use of such restraints in Wisconsin’s youth prisons. “The way that we will maintain safety is by establishing positive relationships with youth,” Mertens said. Sumaiyah Clark, enterprise project administrator at HHS, said the facility will build these relationships through practices such as restorative justice circles, meditation, yoga and arts for healing. It will also include programs to prepare youth for the workforce. She said the county will look to hire staff who can build relationships with youth based on common experiences and who look like the youth they are serving. Mertens said the new county facility will utilize multi-systemic therapy, a form of treatment that involves a young person’s family and is individualized for each youth. The approach is being used in the new county-run residential care facility, Bakari Center. A lot of programming and facility-related specifics are still unknown, including details about the education that will be provided and the number of beds the facility will hold. Said Gwendolyn Bivins, a middle school teacher who lives near the proposed facility locations, “It’s not about the facility, but it’s about what the facility is going to stand for.” She said she hopes to see adequate mental health support available. Aaron Kelly, a correctional officer at the Vel R. Phillips Youth Detention Center, said that he hopes the families of youth directly affected by the system are included in conversations about the new facility. His sister, Jasmine Kelly, said she thinks it would be good to talk to or survey incarcerated youth about what they would like to see changed. Both of the proposed locations for the new county facility are in County Supervisor Sequanna Taylor’s district. Taylor and other county officials said they want to hear residents’ feedback on the proposed facility. 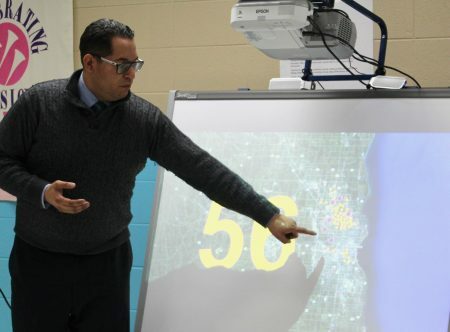 A community input session hosted by Ald. Chantia Lewis will be held on Thursday, Jan 31, at 6 p.m. at Direct Supply, 6663 Industrial Road. Under the state legislation, Milwaukee County needs to submit a grant proposal by March 31 to receive funding from the state for the facility. Gov. Tony Evers was recently quoted saying that the state may consider pushing back the deadline, but Mertens said that Milwaukee County is advocating to maintain the current timeline. “We want to bring our youth home from Lincoln Hills as soon as possible,” he said. Thanks for this article Allison. I look forward to your continued coverage on this matter. Sure hope these new ideas a facilities will help. Hope you will get the buy in from family in the process. Sounds like you have some dynamic city leaders on board which is awesome–like Clark and Muhammad. These adolescents need positive attention and I wish you all the best in implementing these exciting and needed changes. Thank you! I hope whichever site is selected can easily be reached by bus.